Y Ortiz de Guinea, J Villafañe, C Caffarel-Serra (2018): “Research for the assessment of media reputation”. Revista Latina de Comunicación Social, 73, pp. 845 to 869. Introduction. The article presents the results of a pre-test conducted in Castellón in 2017 as part of the R&D project titled “Media reputation in Spain and Europe” (CSO2017-87513-R). Methods. A questionnaire exploring media reputation’s journalistic and business variables and 31 dependent variables was applied to 24 highly knowledgeable panellists. Questionnaire data were used to establish the journalistic and business variables of media reputation and the stakeholders on which media reputation depends. Results and conclusions. It has been concluded that it is not possible to assign a standardised media reputation profile to stakeholders, that the most economically important stakeholders are those that are more highly valued by panellists and that there are two defining values in media reputation: journalistic excellence and economic viability of the medium. Media-corporate reputation; journalistic reputation; stakeholders; media reputation profile. 1. Introduction. 2. Methods. 3. Results. 4. Conclusions. 5. References. The purpose of this research is to test a method designed from scratch to assess the reputation of the different media. Reputation is a concept used in areas as diverse as companies, cities, countries and some institutions, such as the university. However, the literature review related to media reputation has revealed very few references. The absence of specific literature has been a problem but also an incentive, and a greater methodological challenge, given that the research area that this text opens will be carried out by its authors and other scholars who are members of the Media Reputation Lab, an interdisciplinary and international research group composed of eighteen researchers from several European universities and specialised in reputation theory, media and communication. The members of the research group, and the people consulted by them, broadly agree on the crisis of social media, especially in the United States and Europe, where many prestigious media companies, publishing companies in particular, and many media companies in general, have been strongly affected by the economic crisis of 2008. This crisis has been felt in the business and professional fields and this has encouraged us to form a solvent and robust research group with the two already mentioned features, interdisciplinary and international, and to test a method needed to carry out future research with scientific rigour and particularly the project titled “Media reputation in Spain and in Europe”, which has been approved by the R&D Committee of the Spanish Ministry of Economy, Industry and Competitiveness (CSO2017-87513-R). For this reason, this research focuses on the geographical and media scope of the Spanish province of Castellón, where we tested, with equal rigor, part of the methods that will be applied to the Spanish and European fields, together with the rich experience that this research has provided and that will improve the methodological approach of subsequent research. This research has two types of objectives. The first ones are epistemological, which according to Bunge (1985) must establish the foundations of the research: the object to investigate, its limits - what is included and excluded from the object of research, the method and even, if necessary, the basic notions and axioms of the theory or theories that will be used to analyse the aforementioned object of research. The first of these objectives – the scientific object – is to define media reputation: the nuclear concept that will substantiate the research. The second group of objectives are pragmatic and seek to identify the components of a medium’s reputation: the tree of values, variables and indicators which, after their analysis, will provide the qualitative and quantitative elements necessary to make media reputation objective. The problem of the research is two-fold: first, to formalise the concept of media reputation with sufficient epistemological validity and validate a research method. The theoretical framework chosen for the evaluation of the media is the theory of reputation, which has been successful in other studies with very diverse research objects: companies (Fombrun. Ch., 1996); countries (Van Ham, 2001; Kunzik, 1990; Boulding, 1956; 1959; Anholt, 1998, 2000; Jervis, 2006; Inglehart, 1991); and cities, (Seisdedos, 2007). The method needed for an research of this nature should start with a deep qualitative study that establishes the values of reputation, i.e., the foundations on which a media reputation depends unquestionably and, based on those reputation values – which are necessarily generic – identify more specific and measurable reputation variables and objectives, because the reputational assessment of any object requires rigorous and precise metrics and this is only possible if we have the aforementioned metrics. The importance of this research is equivalent to the influence that the media have historically had and still have in modern societies and we will be closer to establish a more rigorous assessment of the magnitude if we add two recent factors: the technological change and the economic crisis of 2008, which have caused a transformation in the media sector, which has been unparalleled in any other sector. It is not easy to analyse the effects of this media crisis because the theoretical paradigms employed so far, and derived from the theories of communication and information, as well as the scope of information companies, have been obsolete to account for a phenomenon that not only has an economic origin, but has also been complicated the digitisation and deregulation of the media, which are coincident in time but have different origins. This research is based on reputation theory as a theoretical framework to try to overcome some of the current weaknesses based on a first scientific trial in the Spanish province of Castellón, carried out between November 2016 and January 2017. As mentioned, there are currently very few references in the academic literature about media reputation. However, different disciplines and authors have approached the object, and some of them, although with different objectives, are useful to contextualise this research. The theory of communication perhaps sets the main field of study of media reputation. As the 2017 Trust Barometer points out the media are the institutions that lost the highest percentage of trust since 2016: 5% (https://html1-f.scribdassets.com/7kku8b4lq85o07xp/images/6-3a10329803.jpg). This loss of trust is comparable to the loss of reputation that the media has suffered in the last ten years, whose decline began with the financial, economic and social crisis that broke out in the United States in 2007 with the subprime mortgage crisis, which has continued to hurt the media sector. According to the annual report prepared by the Madrid Press Association (APM, 2017), for journalists, the lack of independence, rigour and neutrality, as well as unemployment, job insecurity and low wages are the main problems. According to the report, journalists scored with a hold the degree of independence to perform their work and this trend continued throughout 2012. From the point of view of the ownership of the Spanish media, most of them do not provide information about practices and policies aimed at protecting their editorial freedom and credibility (Fundación Compromiso y Transparencia, FCyT). This resolution is based on such aspects as composition and characteristics of shareholders, transparency in advertising revenues, and the application of codes of ethics in the twenty major national media groups in terms of importance, number of visits in the Internet and revenue. There are several reasons that explain the fall of the reputation of the media, as well as those derivatives of the economic crisis itself. Below, we summarise the most important. The first and most obvious is the impact of the digital revolution, together with the development of social networks and the impoverishment of journalistic values in a context of economic crisis. The momentous change of model induced by the Internet and the digitisation and deregulation of the media system have contributed to their transformation in recent decades. In this sense, it is useful to research the reputation of online media and the influence of social networks (Madden and Smith, 2010; Aula, 2010; Del-Fresno-García, 2011; Fontdevila et al. 2012), as well as the reputation of traditional media. The latter are those who have suffered the most from the recession, including some media that were prestigious for many years. In fact, all the European newspapers have experienced a great evolution in the last fifteen years (Ramírez de la Piscina et al. 2014). The use of social networks has led to a post-media type of communication. An evolution that is more like a colloquium than the traditional information produced by 20th century media. Their models are different, but their impact and influence are greater or equal. The quality can be the competitive advantage of traditional and born-digital media. An opportunity to regain the quality requirement and mark a differentiating strategy (Campos-Freire, 2008). In addition to these approximations made in communication theory to the analysis of the reputation of the media, there are some works and relevant research that provide a conceptualisation of the very concept of media reputation, which constitutes a considerable contribution. For example, Ortiz de Guinea defines a medium’s reputation “as the recognition that the stakeholders of said medium make of its professional and entrepreneurship behaviour, depending on the degree of satisfaction of its expectations” (2015:84). Without a doubt, the greater contributions to the object of research come from the field of reputation theory applied to companies. The concept of reputation has had its greatest development in the world of business and organisations. These areas contain the largest number of scientific and academic sources (Villafañe, 2004, 2009; Carreras, Alloza and Carreras 2013) that have been used as a theoretical framework for the definition of the concept of media reputation. Reputation is a binomial that includes the behaviour of such medium - its journalistic and business reality- and recognition, i.e., the assessment that its stakeholders make of this reality and journalistic and business performance depending on the satisfaction of expectations with relation to said medium. The notion of credibility (Metzger et al. 2003) is defined as the degree of accuracy of a piece of information, and it is estimated depending on the impact of the specific peculiarities of the medium in the credibility of its communication. This notion involves other media indicators and is located at the top level of journalistic reputation (Ortiz de Guinea, 2015). Credibility is a necessary condition, but in no way is enough, for the assignment of reputation to a medium. Put differently, credibility is a professional variable that determines directly the creation of a medium’s reputation. With the dissemination of some media credibility indexes (Gaziano and McGrath, 1986), professional theories have always considered the concept of credibility as the last trench of quality journalism, and impartiality as one of the key elements of the preeminent press model. Different barometers and public opinion studies measure the credibility index of media and journalists (Trumbo and McComas, 2003); the barometer of the CIS, and the annual report of the journalistic profession of the Madrid Press Association (APM) in Spain. The Eurobarometer in the EU and the barometer of the American Gallup Institute. There are previous and recent Spanish academic studies such as the GIPEyOP survey on media and communicators of the University of Valencia; the analysis of the daily press from the perspective of the consumer (Calvo-Porral et al. 2014)- However, there is no study that evaluates media reputation as a whole or analyses the recognition and satisfaction of stakeholders’ expectations in relation to a medium. These studies and assessment tools understand the reputation values of journalism as: freedom of information, professional ethics, fairness, accuracy, quality, and originality. But the concept of media reputation is also used routinely to refer to strategic and business assets and resources that have the same importance for any other type of business corporations (Deephouse, 2000). The report produced the Commitment and Transparency Foundation (FCyT) in 2017 infers that a large majority of Spanish media groups do not provide information on their practice when it comes to ensuring their editorial freedom and credibility. In the case of news enterprises, the fragility in any of these two magnitudes - professional exercise and practice and entrepreneurship capacity – affects their reputation (Murphy, 2010). The reputation of the media emerges from the contribution of certain intangible values of information companies. The reputational doctrine already has a significant number of studies that delve into this idea (Mínguez, 2002 and 2004; Cornelissen et al. 2006; Barnett et al. 2006; Quevedo et al. 2009). This is so because it has been adequately demonstrated that reputation: increases the value of companies (De Quevedo et al. 2009); reputation attracts investment; differentiates the commercial offer by building loyalty and linking the consumer (Akerlof, 1970; Caminity, 1992; Selnes, 1994; Shapiro, 1983; Klein and Leffler, 1981; Milgrom and Roberts, 1986; Obloj and Obloj, 2006; Graham and Bansal, 2007); attracts and keeps talent in organisations (Williamson, 1985); reduces the loss of value of companies in times of crisis (Dowling, 2001); and constitutes the most effective leadership factor (Villafañe, 2004). The Spanish media system is restructuring and adapting its ecosystem. The new polyhedron has a very small vertex on a very broad basis, consisting of a large concentration of small and micro media companies, often with limited budgets. This new media universe has altered its traditional social functions (Canavilhas, 2011). While the media seek to develop distribution models that increase their audience, they seek mechanisms that enable them to sift through the overabundance of information that enters through social networks. It comes to be a reworking of the old gatekeeping (Canavilhas, 2013; Villafañe, Bustamante and Prado, 1987). Reducing as much as possible the danger of disappearance and the need to survive in this crisis encourages media to promote their reputation and take care of other intangible corporate assets; i.e. through a heterogeneity of acts that cannot be reduced to the value of their content, or their effectiveness over consumers or users, nor to the credibility of their journalists, but refer to the sum of everything that constitutes their own brand and reputation and, if consistent, will help to increase their competitiveness in a highly competitive, confusing and dense ecosystem. Due to this, the main interest of the media enterprises now, along with their economic balance, is their values: credibility, reputation, ethics, trust and sustainability. Sustainability implies a behaviour according to appropriate environmental, ethical, and economic patterns while reputation is the source of collective trust. The media have a direct influence on the configuration of politics and public opinion (Luhmann, 2007). Today, we must take this into account based on new categories of media social mediation, from the perspective of the agenda-setting and framing in public opinion (McCombs, 1972, 2004), but also in the realm of social relations, and the sustainability and reputation of the media. Currently, we are witnessing a continuous interaction between the media, society, political actors and companies, which produces, according to Castells (2008), a procedure of dual confluence: political and technological. With regards to Europe, the decline in influence and credibility has also damaged media of reference in countries with great democratic experience. For example, in Scandinavian countries the figure of the ombudsman enjoyed great prestige in newspapers, especially among the most reputable. For this reason, we will assess the current situation of this figure in news companies and newspapers in these countries, as another component to judge the matter under study. It should be noted that the prestigious New York Times, a benchmark medium of quality journalism, has recently eliminated that figure, which has generated much controversy both in the profession and in the academic world. Based on the European, and particularly the Spanish, situation, we will examine whether the improvement and transformation of the media contributes to the assignment of reputation by stakeholders. The studies carried out in our country, with respect to the level of innovation developed in the field of information invariably have positioned El Confidencial newspaper in the top positions (López del Ramo and Torregrosa Carmona, 2013; De Lara et al., 2015). Specifically, regarding the innovations of this digital medium, studies have positively noted the innovations related to information content, as well as the creation of an innovation and product lab (Vara-Miguel, 2016). This article is part of a research project on media reputation funded by the Spanish Ministry. The first phase involved a pre-test in the province of Castellón and was guided by three hypotheses. The first hypothesis is concerned with the two canonical values on which media reputation depends: journalistic and business values. Each of these media reputation values is broken down into different reputation variables, whose identification and assessment are two of the most important objectives of this research. In relation to the breakdown of media reputation into a set of journalistic variables and other business variables - the second hypothesis - it was believed that journalists were the most important variables. Another central research objective has been to identify and rank the importance of the stakeholders of the media, which derives from the third research hypothesis which proposes that those stakeholders on which the economic sustainability of media depends have greater importance. One last research question, the fourth hypothesis, is whether the reputation of a medium is homogeneous or whether it depends on the segment of experts who evaluate it, and in case it is not homogeneous, what reasons explain the coincidences and differences. The justification of the research hypotheses, objectives and questions demanded a method that combined quantitative and qualitative techniques which are described below. To start the essential qualitative exploration phase of the concept and components of media reputation we created the following panel of experts and opinion leaders: 24 people living and working in Castellón and its province, of whom: 5 are university professors and social leaders; 4 political actors; 6 heads of communication of companies and institutions; 4 media executives, and 5 businessmen. In-depth interviews were applied to the 24 panellists between 1 November and 13 January 2017. The qualitative exploration and interviewee-interviewer dialogue went beyond merely responding to the questionnaire and involved the interpretation of their opinions. 1. In your view, is there a difference between professional and journalistic values and business values on media reputation? (If the answer is no, go to question 3). 2. In global media reputation, what weight do you assign to journalistic values and business values? 3. What journalistic values (Jv) and business values (Bv) do you consider important for media reputation? 4. What objective indicators do the Jv1, Jv2, Jv3... you mentioned depend on? What facts are determinant in each of these journalistic values? 5. What objective indicators do the Bv1, Bv2, Bv3... you mentioned depend on? What facts are determinant of each of these business values? 6. Mention the most important stakeholders of the media and rank them according to their importance on a 1-10 scale, 1 being the least and 10 the most. 7. In your opinion, which are the two media with the best reputation in Castellón, whether local, regional or national? What journalistic and business values stand out in both of them? The last item in the questionnaire collects the 31 variables that the research team obtained through desk-based analysis and after eliminating those variables that did not get enough consensus from the nominal group, which acted as contrast for the research team, which was formed by eight people including 5 journalists and 3 people responsible for finance and other management areas of media companies. The objective was to obtain two different perspectives – from the panel of experts and opinion leaders from Castellón and from the researchers - to enrich the analysis and adopt a more pluralistic and less inbreeding vision of the values on which media reputation depends. 1. Diversity and plurality of opinions. 6. Number of readers and their loyalty with the medium. 5. Journalistic criticism. Periodic evaluation of content. Ombudsman. 3. Comparison. The medium’s own information. 4. Do not use veiled sources. In the opinion of the panellists, the concept of media reputation depended on 64% of the journalistic values, which determine unambiguously such reputation, versus 36% attributed to business values. The journalistic variables which were mentioned more than once on top of mind and obtained the greater number of mentions are: veracity (9 mentions), objectivity (8), credibility (5), plurality (4), informative rigour (3) and contrast of sources, ethics of the medium, information independence and professionalism (2 mentions each). The following table shows the indicators panellists used to evaluate the three main journalistic variables, which serve to illustrate the aforementioned confusion on the meaning of these indicators. From the journalistic values, only three obtained more than one mention: business-economic transparency (3), economic independence (2) and sustainability of the medium (2). 1. Transparency. Who is behind it? What’s in the statement of income? 2. Public relations. Independence of judgement. 3. Don’t hide financial interests behind information dissemination. 1. There is no economic contributions of any kind that demand consideration. 2. Independence. Shareholders that define the editorial line. 2. Statement of income, existence of benefits. To the right of the journalistic and business variables listed in the previous tables are the indicators mentioned by panellists, which should constitute the criteria to evaluate the aforementioned variables. 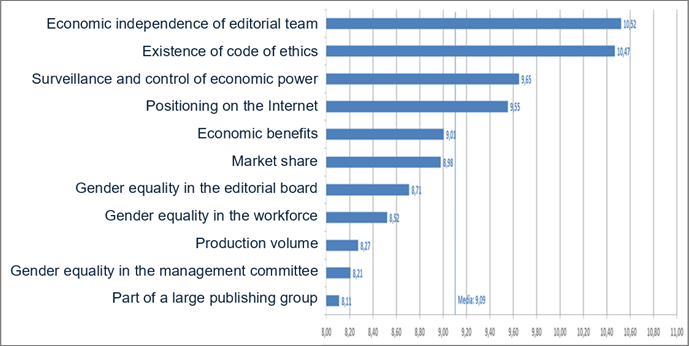 The panel has provided a precise ranking of the importance of the stakeholders of the media (on a 100-point scale) in Castellón, as shown in Table 3 whose results have also been broken down by groups of panellists. This constitutes another finding of the study that confirms the hypothesis 3, given that the two most important stakeholders - advertisers and audience – with a weight in the reputation of a medium of 47.5%, are the most decisive in the economic sustainability of the medium. The importance of four of these stakeholders - advertisers, audience, political actors and society - accounts for more than three quarters of the total importance attributed to them (75,94%), and the four are relevant in different measure for the five groups of panellists who mentioned all of them. The second part of the method consisted in submitting for assessment, to the Panel of experts, a repertoire of 31 media reputation variables obtained by the research team after an exhaustive analysis of sources and contributions especially close to the hypotheses and objectives of the research. Consequently, and irrespective of what future research can demonstrate, the study found empirical evidence with remarkable accuracy, between the typology of variables of the panellists and the research team, that the reputation of a media company depends on two-thirds of the journalistic component, and the remaining one third depends on such medium’s economic sustainability. In order to test hypothesis 4 -there is a homogeneous profile of media reputation variables-, we compared the determining variables of media reputation -both journalistic and business- between the panel of experts and the research team. To do this, we must focus, separately, on the 20 journalistic reputation variables and the 11 business variables that the research team and the panel of experts from the province of Castellón identified as determinants of media reputation. However, with regards to journalistic reputation variables there is a big difference between the variables mentioned by the panel as determinant -accuracy, objectivity and credibility- and those identified by the research team. The variables mentioned by panellists are very aspirational and generic. In addition, when asked about the indicators that allowed the evaluation of these variables, because they possess greater specificity and correspond to more pragmatic than aspirational elements or actions, panellists mentioned 22 indicators, of which only 4 (diversity and plurality of views, contrast of sources, collection of all political sensibilities and choices and differentiation between national and local press) are present, or can be assimilated to any of the 20 journalistic variables identified by the research team. However, panellists mentioned twice as indicator of the objectivity variable, the necessary differentiation between facts and opinion, which is not among the 20 variables identified by the research team and, undoubtedly, should be included in future research. In what refers to the most decisive business variables for the panel as source of media reputation, the differences between the variables and indicators between panellists and researchers are significantly lower. (see Figure 3). For example, economic independence is a business variable cited literally in both groups, and 5 of the 7 indicators mentioned by panellists are also comparable to those mentioned by the research team. One of them, the transparency of the income statement, should also be included in future research. To carry out this analysis we established ± 0.40 as statistically representative difference on the average value of each variable (shown in green in the following tables) to draw some sort of conclusion about the group of panellists in comparison to the total of the panel of experts. 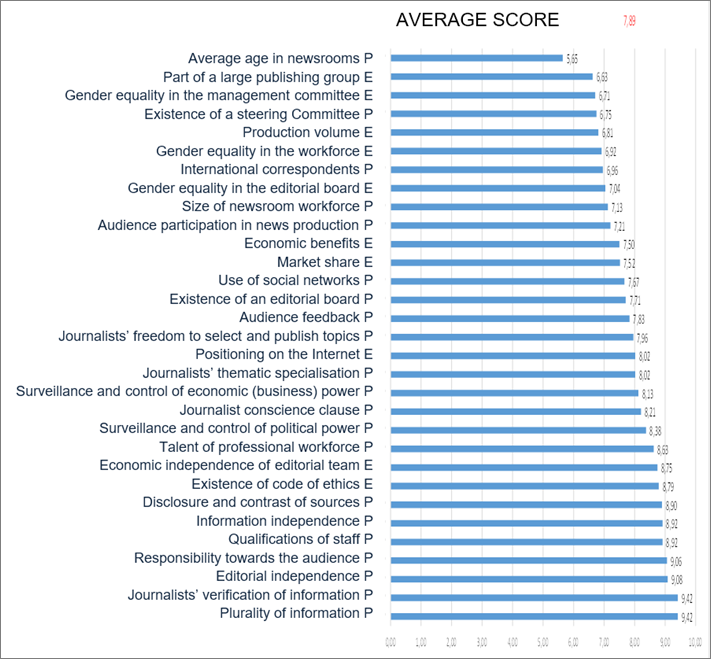 The politicians who are part of the panel assigned above-average scores to the Monitoring -of both the political and economic powers- that the media with good reputation must exercise (+ 0.47). However, this contradicts the two variables related to independence -editorial and information - whose values are negative on both: -0.44 and -0.47, respectively. Membership to large publishing group (-0.45) and the average age of the newsroom (-0.67) are the other two variables with statistically representative differences between the valuation of politicians and the rest of the panellists. Difference between PANEL & Heads of Comm. .b) International correspondents (+ 1.25). d) Existence of a steering committee (+ 0.89). e) Being part of a large publishing group (+ 0.87). a) Existence of a code of ethics (-1.39). b) Journalists’ verification of information (-1.10). d) Responsibility towards the audience (-0.82). e) Monitoring of the economic and business power (-0.78). Media executives made very homogeneous evaluations of the variables of media reputation, of which only five have statistically representative differences. Gender equality in the workforce of the medium (+ 0.70) and on the editorial board (+ 0.65), in addition to the economic benefits (+ 0.51) are business variables highlighted by media executives as the most determinants of reputation. The existence of a steering committee (-0.87) and the Monitoring and control of economic and business power (-0.84) are, on the contrary, the least influential in the reputation of the media according to their executives. 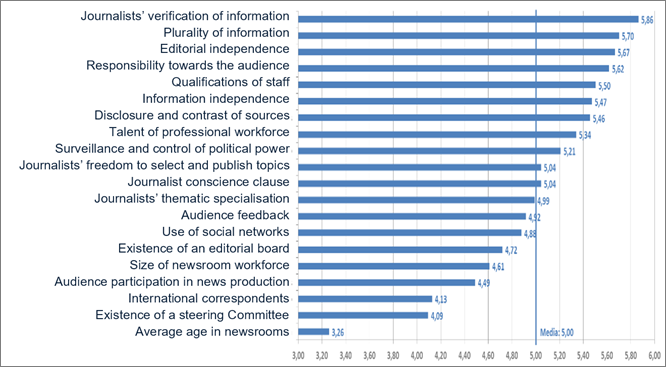 The variables that influence media reputation the most in statistical terms are: average age of the newsroom (+ 0.94), being part of a large media group (+ 0.54), international correspondents (+ 0.51) and the existence of a steering committee (+ 0.49). In contrast, the least determinant variables in media reputation for the entrepreneurs in the panel are: gender equality in the editorial board (-0.85), the workforce (-0.80) and the steering committee (-0.71). It is noteworthy that the three media reputation variables valued the least by businessmen are those considered most influential by scholars and social leaders in the panel: gender equality in the steering committee (+ 0.58), in the editorial board (+0.44) and the workforce of the medium (+0.41). For academics and social leaders, the variables with less weight in the reputation of the media are: the size of the newsroom (-0.67), the Monitoring and control of political power (-0.52), international correspondents (-0.50), production volume (-0.46) and average age of the newsroom (-0.44). The large dispersion in the assessment of media reputation variables by panellists is significant, which resulted in the same degree of atomisation: in the opinion of the members of the panel, there is no remarkable variable that contributes to the reputation of a medium, nor otherwise, i.e. that violates it. The first hypothesis of the research is confirmed since there were no new canonical media reputation values apart from the journalistic variables, directly linked to the work of journalists, and the business variables, of an economic nature. The large dispersion in the assessment of the variables of media reputation has been highly significant. This assessment differentiated between the two categories of canonical values cited by panellists, which has resulted in the same degree of atomisation: in the opinion of the panellists, there is outstanding variable that contributes to the reputation of a medium in a decisive manner, or on the contrary, i.e. that violates it. The group of journalistic variables that are statistically representative, i.e., those that have been mentioned by the five groups of panellists, are only mentioned two times: the existence of an editorial committee, the number of international correspondents and the average age of the newsroom. The group of most influential business variables of media reputation includes variables related to gender equality -in the editorial board (3 mentions), on the steering committee (2) and the workforce of the medium (2)- and also to the membership to a large media group and economic benefits (with two mentions each). It is still paradoxical that only three journalistic variables are so rarely mentioned, only 6 times all together, when the whole group of these variables had been previously attributed -when the panel was asked on top of mind- an importance of 64% on media reputation, although there is not a huge difference with respect to the five business variables, which were mentioned 11 times, and had initially been assigned an importance of 36%. Consequently, the second hypothesis formulated by the research team was rejected, given that business values determine the reputation of a medium to a greater degree. Although this is a risky interpretation, our explanation of this paradox is that the view of the 24 panellists about the weight of journalistic variables in media reputation is more aspirational than realistic, but that they finally supported the more pragmatic view of what makes a medium to be considered reputable, by associating this reputation to the business variables, to a greater extent. The clear conclusion about the stakeholders that are more important in media reputation would, in addition to justify the third research hypothesis, ratify the previous interpretation given that only the first three of the nine stakeholders mentioned by panellists were attributed with 62% of importance in media reputation: advertisers (26.1), audiences (21.4) and political actors 15.5). Finally, the analysis of the assessments performed by the five groups of panellists of the 31 media reputation variables proposed by the research team answered the remaining research question, or fourth hypothesis, in the sense that there is no homogeneous profile of media reputation due to the high diversion of the attributes or variables that define it. It will be necessary, as a result and as expected, to delve into the research on media reputation variables and add the two new variables detected in this study (differentiation between facts and opinion and the medium’s transparency of the statement of income) and to remove those variables that were not considered to be important in media reputation. Akerlof, G.A. (1970). “The market for ‘lemons’. Quality under uncertainty and the market mechanism”. Quarterly journal of economics, 84, pp. 448-500. Anholt, S. (1998): “Nation-brands of the twenty-first century”. The Journal of Brand Management, vol. 5, n. 6. Anholt, S, (2000). Brand New Justice: How Branding Places and Products Can Help the Developing World, Butterworth Heinemann, Oxford. Barnett, M., Jermier, J. & Lafferty, B. (2006). Corporate reputation: the definitional landscape, Corporate Reputation Review, (9), 1, pp. 26-38. Boulding, K.E. (1956). The image: Knowledge in life and society, Ann Arbor, Michigan University. Bunge, M. (1985). La investigación científica, Barcelona, Ariel. Caminity, S. (1992). “The payoff from a good reputation”. Fortune, 125 (3), pp. 49-53. Canavilhas, J. (2011). “El nuevo ecosistema mediático”. Index. Comunicación, 1 (1), 13-24. Canavilhas, J. (2013). “Journalism in the time of a new media ecosystem: what higher education?” Historia y Comunicación Social, 18, pp. 511-521. Cornelissen, J., van Bekkum, T. & Van Ruler, B. (2006). “Corporate communications: a practice-based theoretical conceptualization”, Corporate Reputation Review, (9), 2, pp.114-133. Carreras, Alloza y Carreras, (2013). Reputación corporativa. Introducción en el carácter científico de la gestión de la reputación corporativa, LID Editorial. Castells, M. (2008). “Comunicación, poder y contrapoder en la sociedad red (II). Los nuevos espacios de la comunicación”. Telos, n. 75, pp. 11-23. Deephouse, D. L. (2000). “Media reputation as a strategic resource: an integration of mass communication and resource-based theories”. Journal of management, 26 (6), pp. 1091-1112. Del-Fresno-García, Miguel (2011). “Cómo investigar la reputación online en los medios sociales de la web 2.0”. Cuadernos de Comunicación Evoca, vol. 5, n. 1, pp. 29-33. De Quevedo, E., Delgado, J. B. & Fuente, J.M. (2009). “Financial Impacts of Corporate Reputation”, in Helm, S., Liehr-Gobbers, K. & Stork, C. (eds.) Corporate Reputation Management, Editorial Springer. Dowling, G. (2001). Creating Corporate Reputation. New York: Oxford University Press. Fombrun, Ch. (1996). Reputation. Realizing Value from the Corporate Image, Harvard Business School Press. Fondevila, J.F., del Olmo, J.L. & Bravo, V. (2012). “Presencia y reputación digital en ‘social media’: comparativa en el sector de la moda”. Fonseca, Journal of Communication, n. 5, pp. 92-116. Gaziano, C. & McGrath, K. (1986). “Measuring the concept of credibility”. Journalism quarterly, autumn, pp. 451-462. Gómez Mompart, J.L., Gutiérrez Lozano, J.L., Palau Sampio, D. (2015). “Los periodistas españoles y la pérdida de la calidad de la información: el juicio profesional”. Comunicar, n.45, XXIII, pp.143-150. Graham, M.E. & Bansal, P. (2007). “Consumers’ Willingness to pay for corporate reputation: the context of airline companies”. Corporate reputation review, v. 10, n. 3, pp. 189-200. Hallin. D. C. & Mancini, P. (2008). Sistemas mediáticos comparados. Barcelona: Editorial Hacer. Inglehart, R. (1991). “Trust between nations: primordial ties, societal learning and economic development” in K. Reif, R. Ingleharts (eds). The dinamics of European public opinion, MacMillan, London. Jervis, R. (2006). “Foreword”, in Herrero de Castro, R., La realidad inventada. Percepciones y proceso de toma de decisiones en Política Exterior, Plaza y Valdés. Klein, B. & Leffler, K.B. (1981). “The role of market forces in assuring contractual performance”. The journal of political economy, v. 89, pp. 615-649. Kunzik, M (1990): Images of nations and international public relations, Bonn: Friedrich-Ebert Stiftung. López del Ramo, J. & Torregrosa Carmona, J. F. (2013). Rutinas productivas en los diarios digitales españoles: caracterización y desarrollo en la dinámica de la convergencia. Ámbitos: Revista internacional de comunicación, nº 22, pp. 111-120. Luhmann, N. (2007). La realidad de los medios de masas. Barcelona: Anthropos Editorial. Madden, M. & Smith, A. (2010). “Reputation management and social media”. Pew Research Center. McCombs, M. E. & Shaw, D. L. (1972). “The Agenda-Setting Function of Mass Media”. Public Opinon Quaterly, 36, pp. 176-187. Metzger, M. J.; Flanagin, A. J.; Eyal, K.; Lemus D. R., & McCann, R. M. (2003). “Credibility for the 21st century: Integrating perspectives on source, message, and media credibility in the contemporary media environment”. Annals of the International Communication Association, 27(1), 293-335. Milgrom, P. & Roberts, J. (1986). “Price and advertising signals of product quality”. Financial economics, v. 68, n. 2, pp. 233-262. Mínguez, N. (2002). “La reputación corporativa y su medida”, in Benavides, J., Alameda, D. & Villagra. N. (eds.) Comunicación y cultura en la sociedad del conocimiento, Ayuntamiento de Madrid y Fundación General de la Universidad Complutense, Madrid, pp. 41-51. Mínguez, N. (2004). “La imagen de España: un proyecto en construcción”, in Villafañe, J. (Dir.) El estado de la publicidad y el corporate en España y Latinoamérica, Madrid, Pirámide, pp. 277-284. Murphy, P. (2010). “The intractability of reputation: Media coverage as a complex system in the case of Martha Stewart”. Journal of Public Relations Research, 22 (2), pp. 209-237. Obloj, T. & Obloj, K. (2006). “Diminishing returns from reputation: do followers have a competitive advantage?” Corporate reputation review, v. 9, n. 4, pp. 213-224. Ramírez de la Piscina, T., González Gorosarri, M., Aiestaran, A., Zabalondo, B., Agirre, A. (2014). “Periodismo de calidad en tiempos de crisis: Un análisis de la evolución de la prensa europea de referencia (2001-2012)”. Revista Latina de Comunicación Social, 69. Shapiro, C. (1983). “Premiums for high quality products as returns to reputations”. Quarterly journal of economics, v. 98 November, pp. 659-679. Seisdedos, G. & Mateo, C. (2010). “Different Branding Strategies from the use of the Territory of Origin by Commercial Brands: The Brand-Territory Matrix”. Journal of Town & City Management, Vol.1(2): 175 - 186. Selnes, F. (1994). “An examination of the effect of product performance on brand reputation, satisfaction and loyalty”. European journal of marketing, v. 27, n. 9, pp. 19-36. Trumbo, C. W. & McComas, K. A. (2003). “The function of credibility in information processing for risk perception”. Risk Analysis, 23(2), 343-353. Van Ham, P. (2001). “El ascenso de los estados marca” en La política posmoderna de la reputación y la imagen, Foreign Affaire, vol. 80, n. 5. Vara-Miguel, A. (2016). El confidencial: innovar en contenido como clave del éxito. En Sádaba, Ch. et al. Innovación y desarrollo de los cibermedios en España. Pamplona: EUNSA. Pp. 166-177. Villafañe, J., Bustamante, E., & Prado E. (1987). Fabricar noticias. Las rutinas productivas en radio y televisión. Barcelona. Editorial Mitre. Villafañe, J. (2004). La buena reputación. Claves del valor intangible de las empresas, Madrid, Pirámide. Villafañe, J. (2009). “Reputación corporativa y RSC. Bases empíricas para un análisis”. Telos, n. 79, pp. 75-82. Villafañe, J. (2012). La buena empresa. Propuesta para una teoría de la reputación corporativa, Madrid, Pearson. Williamson, O. E. (1985). The economics institutions of capitalism. New York: Free Press. Article received on 20 February 2018. Accepted on 21 April. Published on 30 April 2018.